Any organisation that wants to build its business long term needs to listen to and act on customer feedback. This need to capture customer feedback has driven many companies to develop and execute customer surveys. The problem is that building a good survey and survey process is not nearly as simple as it seems. So we present some Dos and Don’ts for building a survey that works. Interestingly customers really don’t mind taking a few minutes to provide their customer feedback when you ask them – so long as you don’t ask them too often. One cloud computing service I use, pop’s up a browser every time I finish using it. Being a good customer I filled it in the first 2 or 3 times, but enough is enough. Now I just ignore the request. You need to determine a time between surveys that makes sense for your industry: for some its once a month but for others it may be once year. The same company I noted above asks for name and email address in their form. They already know my name and my email address from my log-in but don’t bother to pre-populate the form to make it easy for me. I have to fill in the same data every time. Not only is this annoying but small mistakes in my typing may prevent them from tracking my perceptions over time. If you want your customer to do something for you at least make it easy for them. This sounds counter intuitive, but don’t ask about Customer Satisfaction. It has been shown that customer satisfaction is a poor indicator of future customer loyalty. You do need an overall “goodness” rating for your survey, but you are much better to use Net Promoter Score® (NPS®) for that. It has been shown to be well correlated to customer loyalty and company revenue. Just as you should not survey too often you should also survey often enough. Make sure that you gather feedback often enough that your staff feel some connection with it and their ability to drive change. 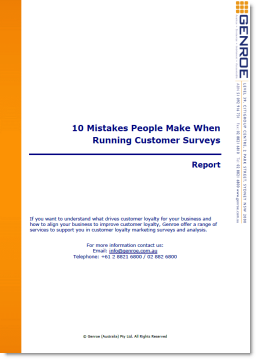 Annual surveys are good but perhaps you should survey 25% of your customers every quarter. That way staff can get much more timely feedback on the changes that they are making without surveying each customer too often. One prospect I spoke to recently asked nervously how many questions I recommended for their survey; “10-15” was my answer. “Thank goodness” was their response as another organisation has recommended 40! Yes, in some circumstances a 40 question survey is warranted but in reality your organisation you should be trying to find the 3 or 4 things that you need to focus on right now. Make sure that you focus on finding those 3 or 4 things. We often see the questions for a customer survey generated in an internal brain storming session. While that is a good start it’s not the whole story. If you want to know what customers care about you need to ask customers not staff. So go out and do some qualitative interviews with customers to get a good range of areas that they feel is important. Then when the survey results come in make sure that you do some data analysis to determine which areas are really important to customers. See the next point for more information. It is notoriously difficult to know how important something is to you and then put a rating on it. So don’t ask your customers to do it either. Rather design the survey process properly and then let the data speak to you. For more information on this topic see this recent post on how to determine what customers think is important. 8. Do realise that the survey is another brand touch point. Remember that customers rate every touch that your brand makes on them, from the billboard advertising on the freeway to the way delivery staff dress, to how you run your survey. You need to ensure that the experience that your customer receives when providing feedback is consistent with the rest of their experience. A poorly run survey will reflect badly on your organisation. We’ve all had it happen: we receive a phone call or email survey request that will only take 10 minutes; 20 minutes later we’re still on the phone. This has two impacts; you give less and less thought to each response as the survey goes on (especially after 10 minutes) and you get more and more dissatisfied with the brand as each minute passes. If you don’t think your survey is too long, check Point 5 and ask yourself again — what can I remove. With apologies to Shakespeare – what is in a word – actually quite a lot. When you create the wording for the survey you need to be careful how you do it. Otherwise you may get a very distorted perception of what the customer really thinks. Incidentally if you want to ensure that your questions are worded correctly have a look at our customer survey question audit. It could save you from wasting a lot of time and effort. Before your organisation can react to customer feedback it must be delivered to the only people in the world that can make that change for you: your staff. If you don’t give them the feedback then all you have done up to now is a waste. Make sure that you communicate to your staff what customers really care about. You will be amazed at what your will do once they know what drives customer loyalty. Lastly, do something. A customer feedback process that collects data and does nothing with that data is a complete waste of time and money. Make sure that the last step in the chain is to drive change into your organisation using the information that you have carefully captured in the customer feedback process. Do you have any other do’s and don’ts for customer feedback processes? Leave a comment and let me know. What a great article to read! I particular appreciate that you suggest to not survey customer satisfaction. Here is an article that may be of interest to you. Basically it outlines a stakeholder survey and the steps that need to be taken for it to be a successful organisational tool to implement. Let me know if you have any questions about the article – it would be great to keep connected! Pre-populating data that are already known from the surveys conducted earlier is underrated when it should be one of the topmost factors to be considered while conducting surveys that are carried out regularly. Majority of your customers do not like taking surveys so it is indeed one of the best ways to increase participation. Many tools such as Qualtrics, SoGoSurvey, etc. provide this feature.